Earlier this month I had a chance to visit Central Public School (website) with Rebecca Rouse (@rebrouse) to have a first hand experience observing our JK/SK students using iPads. Central P. S. is one of 5 Waterloo Region District School Board sites participating in a focused study on the impact of the use of iPads to support early reading and early literacy development in our students. Upon arriving at the classroom, we initially stayed off to the side to observe without interupting the natural flow of the classroom. A kindergarten classroom is a busy space, and I was immediately struck by my initial observations. There was certainly an air of energy and excitement in the classroom. Students were checking with staff to see when it was their turn to move to the iPad station. Clearly, they were motivated and did not want to miss their turn. I was very impressed with preparation and organization of teachers Brenda Fowler Mandy Serpa. They had really thought through the physical logistics of managing the iPads within this busy environment. iPads were numbered via the screen background for easy tracking. Cases were used for protection during storage and transportation from room to room. A picture book of app (application) icons was created to assist the students in locating the correct software. Screens were cleaned regularly to maintain the sharp image and reduce germs. I also noted how careful the students handled the technology – impressive! With guidance from the staff, students used a variety of apps (applications) for word recognition, spelling, personal exploration and story creation. Eventually we joined the student table and sat next to the students. 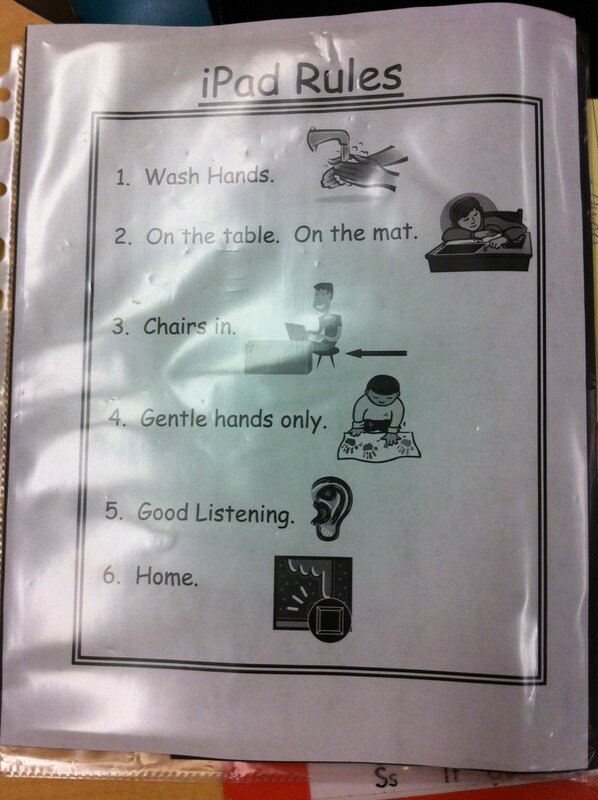 I asked one student what he thought about using the iPads. Without a pause, he enthusiastically stated that iPads were ‘fun and creative’. All of the students were eager to share their work and successes with us. 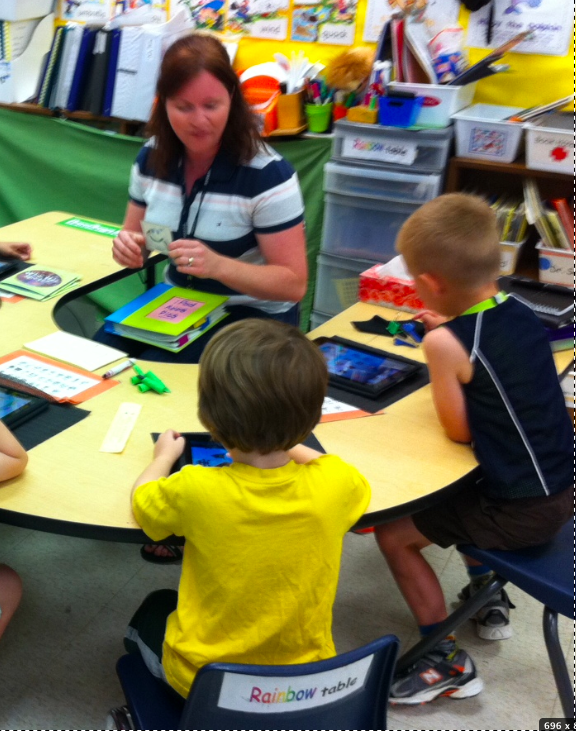 Teacher Observations: After watching the students in action with the iPads at the learning centre in the classroom, teachers shared their observations from the first month of the project. This project has certainly had a positive start. Thank you to Principal Jennifer Crits and teachers Brenda Fowler and Mandy Serpa for sharing their experiences to date. If the results of this proof of concept project show a strong correlation to improved early reading and early literacy then we revise how we allocate technology for all JK/SK programs. Sounds like a wonderful project! I can’t wait to see how it’s expanded when Lexie gets to kindergarten! Great article – the engagement of the students is fantastic. I particularly like the tactile app cards to aid the students in recognition and discovery of the applications necessary for the activity or task. We are not able to purchase iPads in our board but I did manage to get approval for iPod Touch devices for our Early Learning project here. It will be interesting to do a comparison in rgards to functionality between the two groups in terms of form factor, time on task, and engagement.